This design is issue free - no pins or whatsoever - the hands are snap-on design, no tools and post processing is reqiured. It works like a charm printed on my Zortrax M200 layer height is 0.09mm SUPPORTS on all parts but the hand body, (suggest you print separately) hand body is printed vertically with wrist joint socket facing up middlefiners are printed flat with socket holes facing up, same with the fingertips finger hinge is printed with cylinder vertically, wrist ball standing on the peg with ball up thumb joint printed ball down (flat part on the ground) you need to print 1 body, 3 short fingertips, 2 long fingertips, 9 middlefingers, 1 wrist ball and 1 thumb joint per hand still working on the detailing and considering replacing hinges in hand with balljoints, stay tuned! UPDATE - second version of hand body uploaded - different detailing. UPDATE 2 - uploaded a FULL BALLJOINT version of body and an according balljoint hinge. in order to get the thing assembled you need to print the L and R body, 4x full balljoint 58mm ball hinge plus the rest of stuff you need to assemble the fingers. DO NOT MISTAKE the full balljoint 58mm ball hinge" with "v2 thumb hinge" - they are literally he same part but the ball size is different. the assembly should be now much easier and more reliable. as in files it means : 1 hand body L and R - You have 3 versions available. 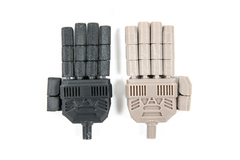 The ones with FULL BALLJOINT in name have full articulation of the fingers and in order to assemble them You need FULL_BALLJOINT_58mm_ball_hinge printed 8 times. for the other hands you need a same amount of hinged joints (v2_finger-hand_hinge) 9 middlefinfger sections per hand (v2_middlefinger_41_ball) 3 short fingertips (v2_fingerv3_short or fingerv3_cut_10mm_v2) 2 long fingertips (v2_fingerv3_long or fingerv3_cut_12mm_v2) 1 wrist ball - You have 3 versions differing in diameter and peg length 1 thumb joint (v2_thumb_6mm_ball_hinge) 4 hand hinge joints 5,8mm (FULL_BALLJOINT_58mm_ball_hinge) any comments or questions please let me know! p.s. the assembly schematics from youmagine here is all wrong, dont even consider it , look at the pictures read the description.